Yesterday, I swore off sewing for A Very Long Time, Or At Least for the Rest of the Weekend. 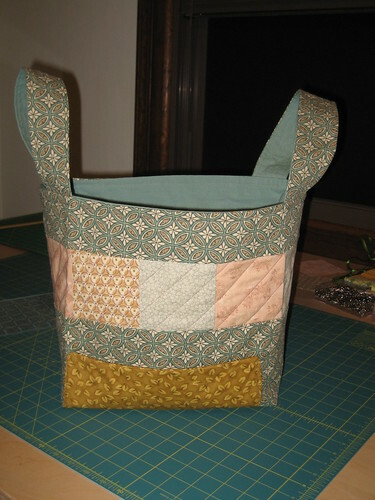 Today, I got slammed with another killer sinus migraine, and apparently, sewing is good for insane headaches. I can’t focus on video games or reading, the thought of cleaning the dishes and kitchen made me cringe with all the loud sounds, and working outside sounded unpleasant, too. Thus, after a four-hour nap, I settled in to make some more bags to better teach myself the process and to recover from being so disappointed with the stinking quilted tote I made yesterday that was an utter fiasco. Oh, I didn’t write about that here, did I? I am haunted with these fantasies of turning into Ree, The Amazing Pioneer Woman, who can cook, sew, photograph, garden, farm, ranch, ride, write and god knows what else, all with exquisite grace and stirring exceptionality. If the site loads slowly for you, it’s because there are approximately 87 picobazillion other people surfing it at the same time, and her server sometimes struggles to keep up with the demand. This woman does it all, and I so want to be like her. I want to go live out West and be self-sufficient and witty and talented… basically, I want to become … voluntarily Domesticated. I want to can tomatoes and make jam and take awesome photos of vegetables I have only just now plucked from the ground. Years ago, there was plenty of time for all of that. Now, as I begin the grind through the last year in my thirties, I realize time is getting shorter than I’d like. Sure, I’m not limping toward Death’s Door with a bad hip, but I am more acutely aware of how much time I have squandered on absolutely asinine things. And while I’m not going to change my ways overnight, I think sewing is a step in the right direction – being productive and learning a craft, as opposed to learning how to better play a spaceship video game. It’s a step in the right Ree direction… except when it’s not. It’s the gold fabric I hate. 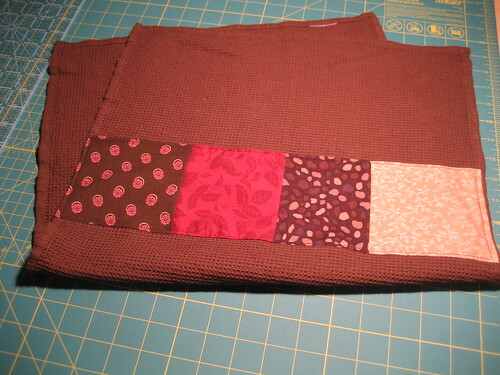 The main fabric is, incidentally, the stuff that matches the blog theme. Cracks me up. The main error I made, apart from putting the handles on sideways, is not paying attention to where I put the pocket on the other side – it wraps around under the bottom. Le sigh. 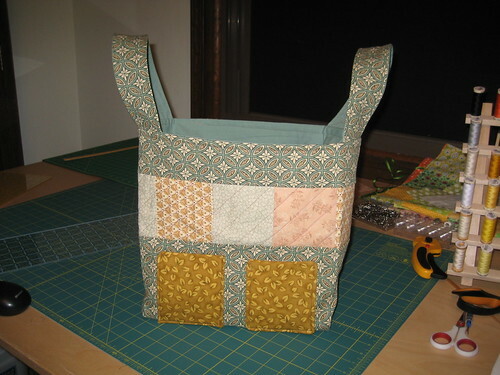 Also, given heavy stuff (garden tools, mature squashes, whatever) could end up in here, I thought it odd patchwork isn’t applied on top of a solid piece of heavy, home-decor-weight fabric that comprises the main body of the bag. It seems like the strip of patchwork with main fabric attached at top and bottom is asking for tears, so I used a triple-stitch (not called for in the pattern) and am hoping for the best. I don’t currently have a lot of garden stuff to tote about, but I wanted to do the project, and now it’s done. It took me all stinkin’ day, too – nearly nine hours – and I ended up with something that will probably live in a corner somewhere. It did, however, teach me a neat way to attach a liner, gave me practice with basic quilting (JoAnn was out of darning feet, so I could only go in a straight line – this is probably for the best, however.) Still, I was burned out, grouchy and generally Done With It All by the time I got everything completed. After finishing, I told Mike I was probably done sewing for a long, long time, because I was so pissed off. I quickly amended it to “the rest of the weekend,” but I didn’t even make it that far. 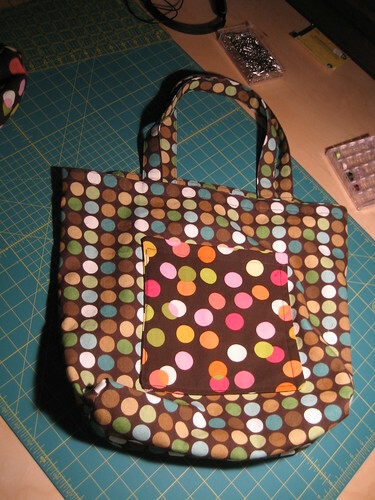 I spent a lot of time last night looking at various tote bags I own – their construction and design, their shortcomings and strengths, and a plan is forming in my head for designing my own tote bag. 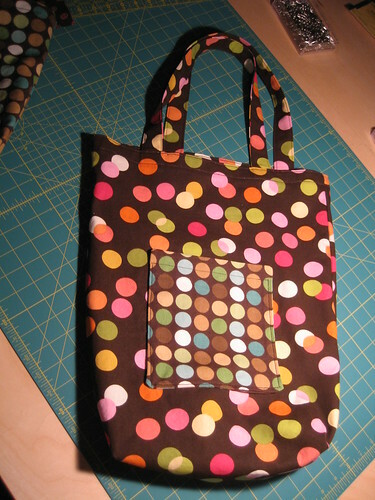 First, though, I need to reinforce the various techniques one needs to, y’know, properly sew a tote bag. Each has a 3″ gusset instead of the 2.5″, and I like the resulting wider bottom better. I’m not going to be of “I could sell this stuff!” quality anytime soon, but if I get a good design I can whip out in relatively short order, I could see parlaying this into something that might pay for some of my sewing supplies. 🙂 I’m not quite sure how I’d even pull it off, though, as home-decor cottons are pretty expensive (these were $9.99/yard, $5.99/yd on sale and each bag requires one yard,) they take a couple of hours to make and I’m not sure selling them for $30 or whatever would really make it worthwhile. It’s something I’m pondering, though, along with various other stuffs. To wind down and do something fun I can decorate the house with, I quickly whipped up two patchwork kitchen towels. These are ridiculously easy, for the most part, although working with stretchy towels is a different experience. The main thing I learned after the first one is, assemble the strip of patchwork so that it is both too wide and too long, and then trim it down straight and to size. I’ve got about 20 towels in different styles and colors and plan to have fun with them. I do need to vary the size of the patches more, though, and maybe throw a few more into the mix. At any rate, that’s been my holiday weekend. Productive, but I should probably remind myself what my awesome boyfriend looks like, because I’ve been a complete recluse for three days straight. Poor, beleaguered Mike Neir. Well, he’s been in his own little universe, too, though, so I reckon it all worked out alright. Still, the fantasy of being the kind of woman who can throw together something useful on the sewing machine, while having an amazing casserole in the oven, tomatoes ripening on the vine and fully obedient dogs who don’t require shock collars to stay in the yard because they so love and respect me they couldn’t imagine straying too far from my side or disappointing me by not coming when called… these things are becoming more and more insistent. Summer is wrapping up now, with autumn being a good time to prep the flower beds and garden for planting next year. Over winter, I’ll sew more, and quilt, and perhaps read and take a few more baby steps toward being A Pioneer Woman in Rural Michigan. Next spring, though, stuff’s gonna happen. God help us all if I end up wanting babies.